Dan Mabbutt of the Independent reported that the United States Congressional Subcommittee on Federal Lands held an official meeting in the Dixie Center on Friday, Jan. 22. It was interesting to note that the front rows held reserved seats for supporters of the Northern Corridor and that the venue was inadequately placed in one of the smaller conference rooms of the Dixie Center. It is fair to say that the standing-room-only overflow could have easily been accommodated by a room twice the size. Not surprisingly, at least to some people, the audience was a pretty equal mix of supporters of the Northern Corridor and those perhaps in opposition. 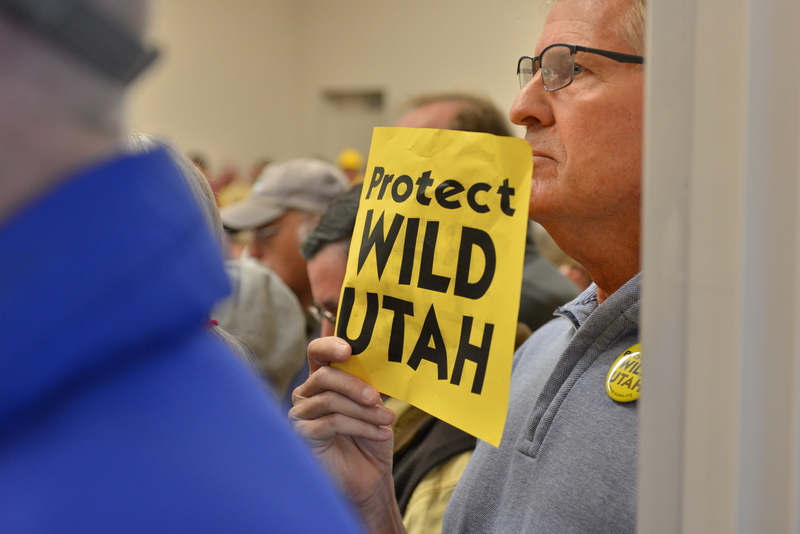 The Southern Utah Wilderness Alliance made its presence heavily known with members bearing “Protect Wild Utah” badges and signs. Oftentimes, what is more glaring in a somewhat contentious environment like this is not so much who is in attendance but who is not. There was an elephant in the room of sorts that was likely in the back of the minds of everyone present. The militia folks who have taken over the Malheur National Wildlife Refuge in Oregon might as well have been there. The meeting was, in my opinion, pretty typical for the one-party state of Utah. Demonizing the federal government, in particular the Bureau of Land Management, is as much a part of this state’s ethos as the notion of Zionist dominion assumed by the predominant culture here. But for all the tension that was present at that meeting, one thing stood out so much that even subcommittee chairman Tom McClintock made note of it when he praised the audience for their civility. Environmentalists and ranchers in the same room getting along and debating opposing ideas and views like Americans. Go figure. While I have been outspoken about the land issue in the West and can fairly be noted for some disdain for the lawbreakers in Bunkerville, Blanding, and now Oregon, I am not obtuse to the concerns or plights of those who feel somewhat like they have no alternative but to fight. That they feel backed in to a proverbial corner is, at the least, understandable. But when civility is foregone in the name of any cause, both those who oppose said cause and those who ardently support it suffer. The men and women currently held up at that refuge in Oregon likely believe they are changing the direction of how federal government operates, but they do not realize why they are actually correct about this. Because of them, it is more likely that more stringent laws will be passed in the long run, and those laws will favor them even less. For instance, the subsidizing of their grazing fees may find itself under scrutiny. The Hage case, was a precursor to the Bundy standoff in 2014. Hage having ties to the Sagebrush rebellion. It was a case, mind you, that set the precedent that will make Utah’s current attempt to revamp that rebellion nearly impossible. That among other things, such as the Property Clause, the Enclave Clause, and even Utah’s own Office of Research and Legislative Council advising that a lawsuit intended to take public land from the federal government is ill advised, lead some to wonder if Utah legislators are simply grandstanding to appease and maintain a majority of their constituency by way of successful failure. And if that is the case, if a legislator such as Utah State Rep. Mike Noel is not obliging his fiduciary duty to represent the interests of all people, not just the ranchers in his state, he is in fact betraying the trust of the American people. And he is also likely emboldening some of the people who are taking the illegal actions we now see in Oregon and perhaps even falsely assuring them of their imperviousness to the law. Which makes him culpable. Think about that. A standing Utah State Legislator inciting insurrection through violence. It is unconscionable. The Property Clause and the Enclave Clause are largely the center of debate here and it is possible that both sides of this have it somewhat wrong. While it is true that the government may not necessarily own land, as Ryan Bundy asserts, it is charged with the fiduciary responsibility to manage land in a manner that represents the interests of all people, not just ranchers. Nothing in this mans demeanor or his speak suggests that he is interested in anything other than the interests of his particular group. It is not constitutional constructionism at all but rather constitutional Bundyism. These laws were enacted and ratified by scholars of law, that is the founders. Men who understood first hand how perilous it was for a monarchist government like the one in England, to have unlimited control over all lands thus all people. These men were seeking to apply some of the jurisprudence of which they experienced to be severely lacking across the Atlantic and create a more fair and equitable system of government. What was not intended was any sort of free for all and surely not for any state to have power that supersedes the nations laws. The founders were firmly against land dispositions that in any way benefitted one part of our country at the expense of others. The ruling by the 9th Circuit is a tell-tale omen of what is to come. Standoffs in the battle for rights to public land will keep going this way and gain momentum. Unfortunately for those iconic western staples who have history here dating back a century or more, the interest in those lands has broadened significantly since the 1800’s. These people are likely outnumbered hundreds of thousands to one in so far as the weight of their voice in the issue in so much as the land they have had unfettered access to for the better part of one hundred years simply does not belong to them. It never did. What has been the norm, whereby a minority group in this country has had a majority control over the western lands, is changing. That is just the simple fact of the matter. Taking up arms against the government only serves to exacerbate their plight, however. Ranchers’ proud legacy in the annals of American history is in grave peril. They could well be remembered and associated more with domestic terrorism than as the rugged individualists who took part in shaping the West. But it does not have to be this way, and for my own part, I would encourage those on the side opposite the ranchers to not only educate themselves in this debate but to also refrain from obtuseness towards these people. They are not all extremists like the few who make most of the headlines; rather, they are honest, hard-working Americans, and their concerns are valid. Their rights to life, liberty, and pursuit of happiness are as important as anyones. When Mike Noel spouted off about there being bloodshed on the horizon, while I find the man curiously childish for a fellow of his position and stature, I fear he is right. Am I alone in saying that this is the last thing any of us want? And what is even more disconcerting about Noel is that he appears to be spearheading the fight taking in to account only the interests of a sect of his constituency and not the interests of all Americans. If there is bloodshed, much of it may be on his hands. Something perhaps the Bundy’s and Noel’s of this issue should consider is that while quite literally no where in the Constitution does it state the federal government is required to give land to states, it does explicitly state that in the enumerated powers of congress, they have the power to deal with insurrections. Noel in particular, is treading a fine line between his duty as a congressmen and seditionist. Cooler heads must prevail here, and honest, rigorous dialogue must begin. The grandstanding of bureaucrats needs to be seen for what it is, and “We the People” need to recognize this and take the debate to a more agrarian level representative of all of us. Dallas Hyland is a professional technical writer, freelance writer and journalist, award-winning photographer, and documentary filmmaker. As a senior writer and editor-at-large at The Independent, Hyland’s investigative journalism, opinion columns, and photo essays have ranged in topics from local political and environmental issues to drug trafficking in Utah. He has also worked the international front, covering issues such as human trafficking in Colombia. His photography and film work has received recognition as well as a few modest awards and in 2015, he was a finalist for the Mark of Excellence Award from the Society of Professional Journalists. Based in southern Utah, he works tirelessly at his passion for getting after the truth and occasionally telling a good story. On his rare off-days, he can be found with his family and friends exploring the pristine outdoors of Utah and beyond. Posted on January 24, 2016, in Nature and the Environment and tagged Bundy, Bundy standoff, insurrection, Malheur Wildlife Refuge, property clause, public lands debate, sedition, Utah public lands, Utah Representative Mike Noel. Bookmark the permalink. 1 Comment. Mike Noel is a member of the Utah House of Representaives: Michael Noel-R Kanab Utah Rancher/water manager…BLM retired.